Defining the core character and philosophy of all Lexus products, L-finesse describes Lexus’s unique and dynamic design thinking. The L-finesse design philosophy is an unwavering focus on a premium and elegant driving experience — amidst a wealth of complex technology. Perfection is not something that can be determined by the most advanced technology. 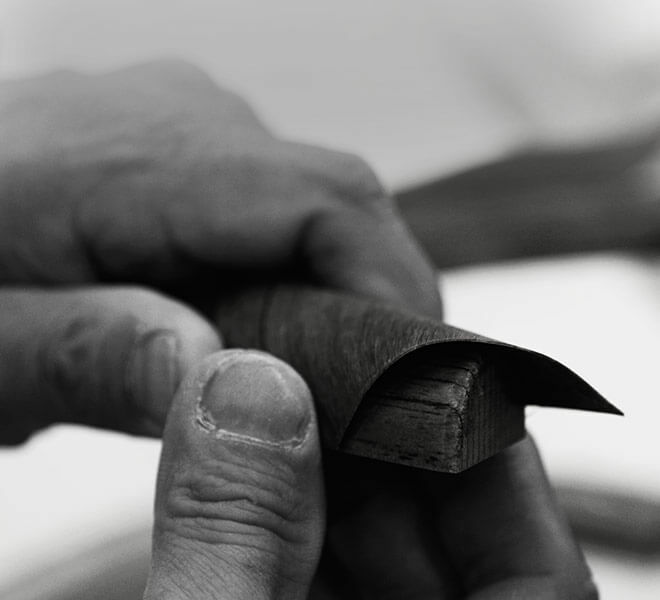 Enter takumi, the master craftsmen who have dedicated their entire lives to perfecting an individual skillset. The takumi at Lexus do the work machines and robots will never be able to. It is only when they apply their masterful touch to a Lexus that the soul of the machine is born. “Thoughtful design” communicates to driver and passengers the feel and experience of a Lexus. Explore below the leading-edge design elements, art and textures developed by Lexus’s expert craftsmen. One of the first things you notice when you step into a Lexus is the wood ornamentation that adorns its steering wheel, dashboard and door panels. Simple as they may seem, the manufacturing of these shimamoku pieces is in reality a long and detailed process requiring 38 days and 67 specialized stages. To develop the ultra-light carbon fiber components used in the LFA supercar, a special machine called the circular loom was invented. Weaving together up to 24,000 carbon fiber threads (each 1/10th the width of a human hair) in a cross-checked fashion, the loom builds seamless structures that are 30% lighter than aluminum while being able to withstand wind forces of up to 202 miles per hour. Highly desirable for both its performance and cosmetic applications, the material can now be found in F models as well as in select Lexus vehicles like the LC. A key reason each individual Lexus appears unique resides in its paint. As every model has its own character, Lexus designers develop and create new colors from scratch to suit it. The process, which can take up to two years, ensures that each color expresses its own unique vehicle traits. The RC F, for instance, marks the introduction of two new colors — Heat Blue Contrast Layering and Lava Orange Crystal Shine. There are currently thousands of colors archived and under consideration in the Lexus color palette. Previously only reserved for European grand pianos, a process called "steel kenma" is applied to the shimamoku wood seen on the steering wheel, side panels and dashboard of select Lexus models. Microscopic scratches, delivered to the surface of the final veneer pieces, take unnecessary shine off the shimamoku while leaving behind an elegant and luxurious finish seen only in European pianos. Executed by Yamaha, this is one process that can only be accomplished through the work of a dedicated craftsman; it cannot be performed by just anyone. Not only aesthetically tasteful, this finish also serves to remove any reflection from the veneers that could potentially distract drivers. Highly skilled craftsmen in the Cambridge, Ontario, plant physically inspect every visible part of a newly manufactured Lexus by hand. With 1,800 inspections and 4,000 measurements, every blemish found is fixed immediately, every imperfection traced to its source, and every single measure is taken to ensure the same mistake will never occur again. As a result of this intensive quality control, the Ontario plant has produced a 98% body accuracy rate for over a decade, the highest assembly level possible. This is the kind of dedication to perfection Lexus commits to in our pursuit of flawlessness. One of the challenges in building the perfect car seat is the balance that engineers have to strike between comfort and style, since a great looking seat may not necessarily be comfortable. In the Lexus NX F SPORT, however, is a seat that has the best of both worlds. Its unique upholstering process, with an intricate interwoven cup-shaped stitching pattern, provides an extra measure of class while increasing material strength and comfort. The beautiful artisan dyed leather on the seat, working flawlessly with the form-fitting integrated cushion, offers extra support while delivering an extraordinary dose of luxury. One outcome of Lexus’s L-finesse thinking is its innovative cup holder. Lined with elastomer rubber (a high-friction material commonly found in the sole of athletic shoes), this specially designed cup holder allows the driver or front passenger to open a water bottle cap with one hand. It is also resistant to dust accumulation, easy to clean, and does not deform when in contact with oil and grease. This simple cup holder is a fine example of Lexus’s commitment to innovation even to the smallest of details.